He may not be steering the good ship Microsoft any longer, but Bill Gates still takes a deep interest in the company he helped to build, with some comments made in a recent CBS This Morning interview likely to raise a few eyebrows. A couple of minutes into the six-minute interview, which covered a variety of subjects, interviewer Charlie Rose asked Gates if he was happy with the performance of Microsoft CEO Steve Ballmer. Instead of jumping in with some corporate fluff about how Ballmer is doing such a fabulous job as boss of the Redmond-based computer giant (OK, there is some fluff in his answer), Gates said that actually both he and Ballmer weren’t happy with Microsoft’s track record of bringing innovative products to the market. Microsoft’s Windows Phone OS continues to languish behind Apple’s iOS and Google’s Android platforms in terms of popularity, with recent comScore data showing it had a paltry 2.9 percent share of the US smartphone market for the three-month period ending December 2012, marking 0.7 percent decline on the previous three months. By way of comparison, BlackBerry had 6.4 percent of the market, iOS 36.3 percent and Android 53.4 percent. 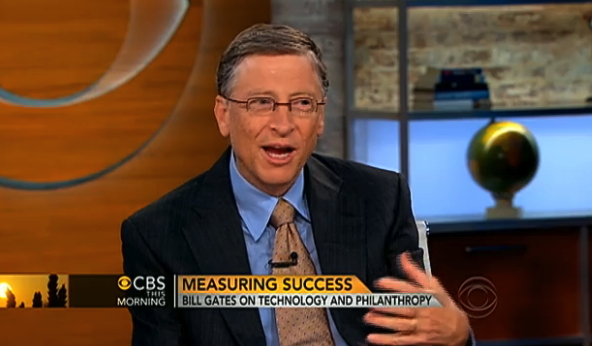 Although Gates currently holds the position of non-executive chairman at the company he created with Paul Allen back in 1975, he now spends the majority of his time working with the Bill & Melinda Gates Foundation, a philanthropic organization he founded in 1994 that concentrates its efforts on reducing extreme poverty around the world and, in the US, helping to improve the education system, among other things.